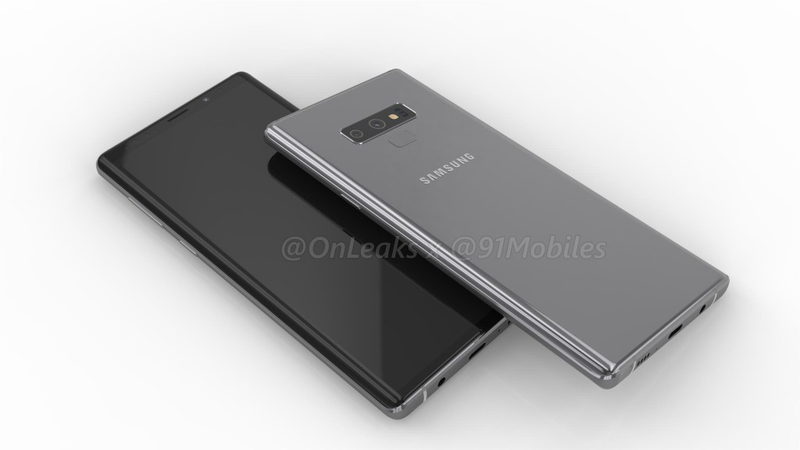 Recently we reported that the upcoming flagship smartphone Samsung galaxy Note 9 is expected to be launched on August 9 , also about some rumors suggesting the revamped cameras on the Note 9 (here). 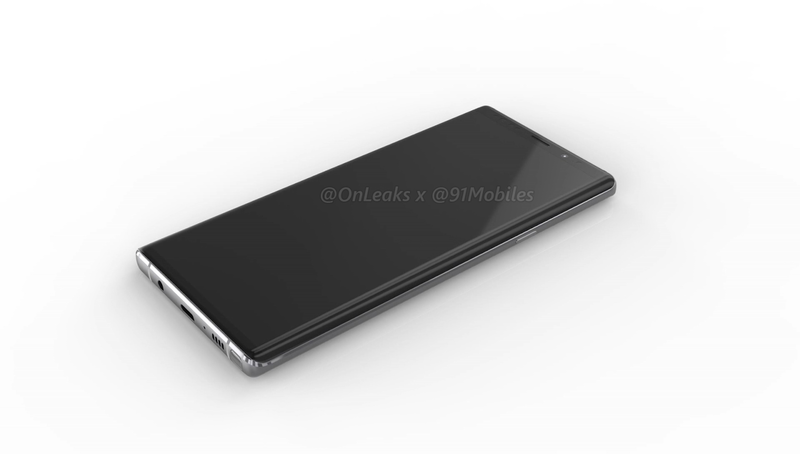 Now today @OnLeaks has released official looking Galaxy Note 9 CAD (computer-aided design) based renders, which shows the design of the device in full glory. The Galaxy Note 9 front design seems to almost identical to its predecessor, when compared to Note 8, the top and bottom bezels appear to be slightly thinner. 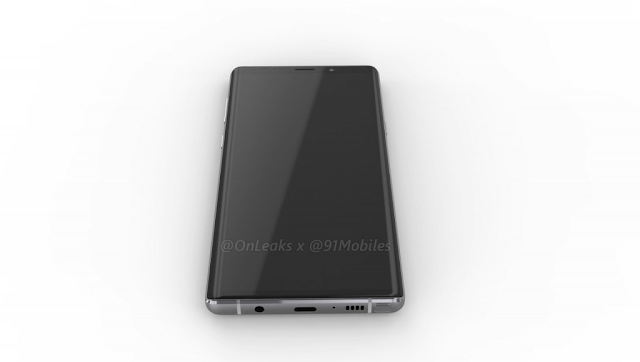 The bottom panel is having USB Type-C port, speaker grille, microphone, 3.5mm headset jack, and the S Pen stylus. The back panel of the Galaxy Note 9 is having horizontally aligned dual rear camera along with the heart rate sensor and the fingerprint scanner is placed just below it. The volume rockers and power button can be seen on the left hand side while the Bixby button is placed on the right. It is speculated that the Note 9 will have a dimensions of 161.9 x 76.3 x 8.8 mm, which seems to be slightly shorter, wider, and thicker than the Note 8 (162.5 x 74.8 x 8.6 mm). The increased width does suggest a marginally bigger panel is being used, which could be around 6.38-inch Super AMOLED display with resolution about 1440 x 2960 pixels. The Galaxy Note 9 would be powered by two variants Qualcomm Snapdragon 845 and Exynos 9810 processor depending on the region. Recent reports has suggested that these processors will be coupled with 6GB RAM and 128GB internal storage. There are also rumors of a 8GB RAM and 512GB internal storage variant but it is not confirmed yet. The device will pack 3,850 mAh battery which seems to be quite bigger than the Note 8's 3,300 mAh battery and it may have the latest Bixby 2.0. 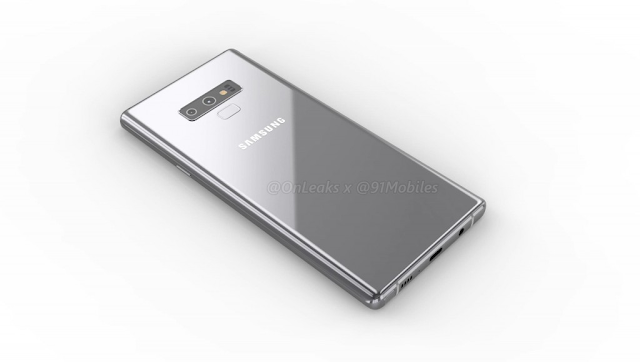 It is speculated that the Galaxy Note 9 is expected to feature an upgraded rear-facing dual camera system, probably the same two 12MP sensors found on the Samsung Galaxy S9+ with variable aperture tech that ranges from a wide f/1.5 to f/2.4. The Galaxy Note 9 likely to keep the wide-angle + telephoto lens combination, also it will be capable of super slow-mo video recording. On front it is expected to feature Portrait Mode with slow-mo video recording modes that debuted on the Galaxy S9 and S9+.